There are too many phony baloneys taking up precious space on planet earth these days and the culprits are us! Hypocrites are not just filling up our churches- they are everywhere you look. You may see one as close as your own reflection in the mirror! I believe mask wearing has become unfortunately an accepted way of life. Every morning that we wake up- we can choose to dress up in the latest popular cultural costume of who we think we want or need to be to be accepted or loved or we can come clean and be the real deal! I can assure you that God already knows who each one of us are under all that cover-up and here is the greatest news- He still loves what He made! Now I need to clarify something here about removing our false fronts! This is not permission for anybody to try to get away with being a jerk! I am not talking about doing away with our responsibility to be courteous or putting aside the definite need to learn and display your proper manners or giving up practicing healthy social behavior! I think the most stifling attitude that anyone can take is where they cease striving to improve themselves. “That’s just the way I am,” can leave you stuck in a deep hole and lead you to being a very lonely individual and result in a never ending stunted growth holding pattern! What I am talking about is the hours, days, months and years we human beings waste by investing more time in polishing up a superficial image or fine tuning a fake façade rather than just learning how to be honest about whom we are and what we need to do to grow in the areas of our weaknesses! Rather than tossing years away protecting a pseudo appearance that feels encumbering and so far from fulfilling- as well as keeping all those individuals that surround you daily in the dark about who God originally made you to be in the light- why not lay the whole show down so the real story starring you can finally start? And amazingly the new adventure all begins not with overloading our ego to accentuate only our strengths but with us recognizing and confessing and admitting that we all have glaring shortcomings! I am thankful for the many steps that I have made- but I am still cognitive of the many miles that I still have to go! Now church life can be a haven for wannabe’s! This is especially sad because church should be a hospital for the soul and not a beauty parlor for the fabricated! If there is ever a place where people should be honest about what we all have been given to work with- it’s a body of parishioners who have genuinely tasted of the amazing grace of God. But rather than shooting for the excellence of what God can do- we settle for the mediocrity of today’s tired script of the same old performances! Anybody who makes you think that they have it all together or never struggle with sin or don’t deal with doubts is lying! I have come to realize that there isn’t a person alive who has become a finished product! We are all still under construction and as believers we should be celebrating the fact that we are under new management! Now even as a Minister, I can either be real about it all and say God do whatever you have to do to continue to make me the man you want me to be- or I can put on a big show and pretend that I am something that I am really not! I call it hiding behind the pyrotechnics of position or the clergy cloak! Make no mistake I take my calling as a Pastor very seriously- but I also need to always remember that I am nothing more than a sinner saved by grace! And the last I checked there is still lots of sin that needs to be dealt with! This is not something I am even proud of! This is just truth! Christians don’t need Jesus because they already are perfect! We desperately need Him because we are so far from the real deal! And I must tell you that no man or woman will make that destination on their own! We all need a Savior and God knew that when the Lord gave us Jesus! So I plug away at my assignments. There are some days I shine like a diamond! There are still too many that I show more soot! But the One who began the good work in me is faithful to complete it! All I need to do is stay out of His way when He longs to pave a holy highway right through my present heart! I put away my idols. I packed away my show tunes! I am singing the song of someone who has been loved not because of what he has done- but in spite of it! Bring on the love of God- because we obviously need lots more of it! 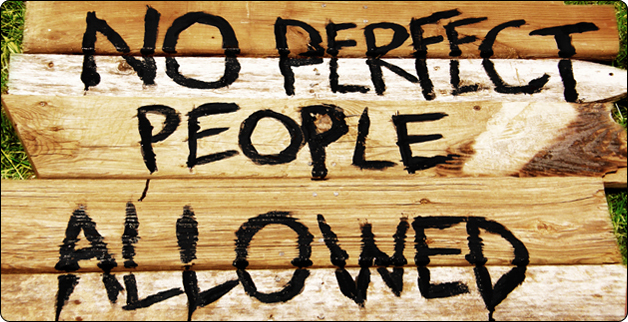 No Perfect People Allowed! Come as you are! You don’t have to dress up. You don’t have to be any particular age. And please don’t feel the need to pretend about anything. God meets people who are far from perfect. That means anyone is welcome no matter where they are on their spiritual journey. And you will definitely see me on the way! It isn’t a road to nowhere! It is the only path that takes us to where we were always meant to be!